I recently realized that I needed to do something. I had 2 apps in the store app stores – use this in a plural form because each country has its own app store, and I rank differently in each one. I was working on a third, but was seeing really crappy download amounts and was making almost nothing through adMob. Needless to say, this is not what I had envisioned when I started my journey to become an app developer. I didn’t expect to be the next Clash of Clans, Flappy Bird, or anything else making an insane amount of money – but I did hope to make enough money to live off. My apps fill needs that I know people have, and do it better than another apps I’ve seen that are similar. I’ve even received several emails, for both apps, thanking me for making them. So I decided it was time to make a change. I needed to put my development time towards marketing. The only problem is, I am terrible at marketing. I understand branding, but getting myself and my apps out there was something totally new to me. Thus, this website was born. I have decided I am going to do what it takes to get my apps in front of as many targeted users as I can, and while I do so I am documenting my successes and failures so I can help others in my former situation make the money they deserve with their mobile apps. Which brings us to today’s topic – App Store Optimization. If you have been following me, you will notice this has been a major topic as of late. The reason is, ASO is something you can do today to get more traffic to your app in the app stores. It is also the first thing that I have done in my quest to more downloads. I’ve written an overview of what ASO is, I’m writing an eBook right now, and am also giving away a pdf of ASO tools that I use, or have heard good things about, for free by signing up for my newsletter. But all that information is fairly broad – even the eBook, as of right now, is fairly high level with some action steps included to help people get started. So today I am writing a little deeper on what I consider to be the first and foremost important part of your ASO strategy – the part that will get the right people in front of your app, the people who want what you have to offer and are actively searching for it. If you haven’t guessed it by now, I’m talking about the keyword research. Having good keywords is what will determine whether or not you show up when people search for you. Your keywords are the only real thing keeping you being found again and again. Today I am going to talk specifically about my favorite keyword research tool, which has parts you can use for free, and other really cool things that you need to pay for – though you can get a free trial of them to check them out. Also, the screenshots that follow are all for my app My Food Storage, incase you are curious. I intentionally didn’t show all of the keywords that I am ranking for, but I do mention a few things that I found – including specific keywords – later in the article. SensorTower allows you to connect your iTunes connect account so it can grab all of the keywords you are using in your app page, as well as actual download amounts and revenue from purchases. It allows you to track how you rank for chosen keywords, as well as look at the likely keywords of your competitors. It shows you how much traffic each keyword has – guesstimates only because the app stores don’t release actual search data, but these are pretty good guesstimates – and the number of apps that are trying to rank for that particular keyword. This is great, because you can see what your competitors are doing, how they are ranking, and either use the same keywords, or similar ones with equal traffic but less competition. In particular – and most other developers wouldn’t release this information even on pain of death – I found a keyword that was getting really similar traffic to a keyword I was already using – pantry – that had almost no competition – larder. Now, on the iPad, I am ranked number 1 for that keyword. This helps me get in front of more people. I already knew the word larder, but had never thought to use it as a keyword, since most people don’t know what it means – btw, pantry is a more specific term for larder; pantry is an actual place whereas larder just means where you store your food. Since doing my first round of keyword research I have close to doubled the number of downloads a day within a couple of weeks. While this isn’t a huge number of downloads, getting 186% the downloads is a big deal. I saw a 125% increase in downloads starting the very next day. My downloads have been increasing, on average, since doing this. I have been moving up the charts on the keywords I rank for. Once my other strategies start to kick in, I should start seeing much more traffic, more downloads, and more revenue. I’ve already seen a more than double increase in my revenue, and my keyword research was a big part of this – there are a few other factors as well, but they are fairly small. Now, onto a little more about what you can do with SensorTower, and why I recommend them to other developers. These are broken up by the different sections of SensorTower’s App Intelligence interface. You can get a general overview of an app here, yours or a competitors. 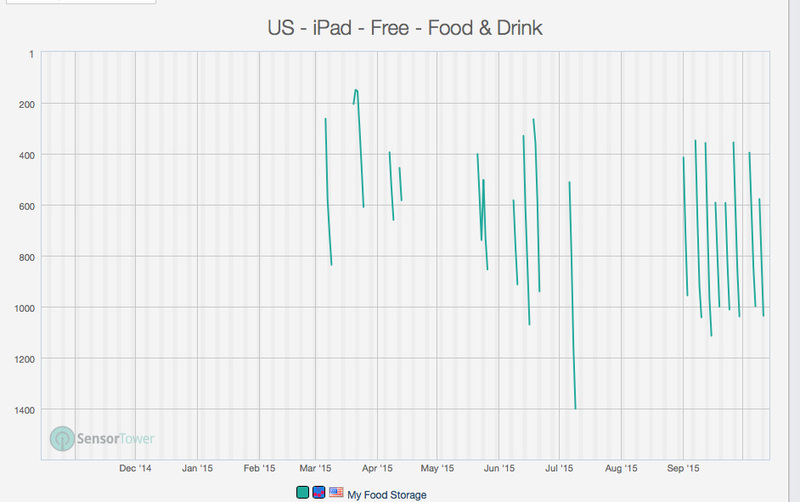 It shows you a big picture amount of likely downloads – a range of downloads that the app likely falls under. The all time reviews, and reviews for the current version. When each review came in. The review history, broken down by country, can help you know which localizations you should focus on. Estimated app worth – I’m not 100% sure what they base this information off of. 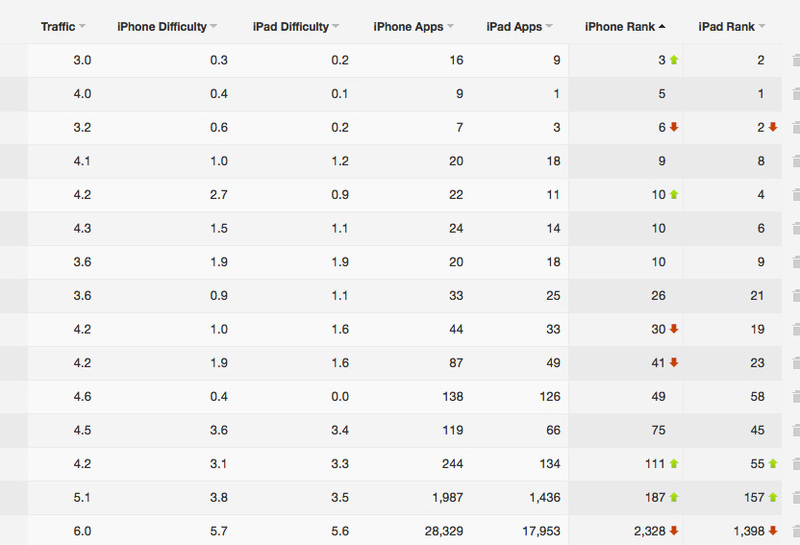 And a list of related apps – so you can find its competitors and see how well they are doing. Category rankings where you can see which categories the app has ranked in, as well as a graph of its ranking over time. You can also see where and when you were a featured app – which country and which category. Currently Go Coder is ranking as a featured app in other countries, even though most of my downloads are from the US. You can track where your downloads are coming from, as well as where your sales are coming from. Again, useful to know where you should focus your localization efforts. Keyword Ranking is where you can check your apps ranking for different keywords – you can only add so many keywords on the free trial. This shows you not only your current rank, but the total apps ranking for that keyword, and whether you are moving up or down the ranks currently. Next is the keyword optimization, where you enter the full name of your app, as well as the keywords in your keyword list. This will tell you if you are duplicating keywords, if a keyword is too long, how many characters you have left, and any other potential keyword mistakes you might be making. You can also see how you rank for each of the keywords you provided. You can do keyword research, very similar to the google keyword research tool, to see what kind of traffic exists for a certain keyword, what apps are ranked highest for it, and how difficult it will be to rank for that keyword. You can also use the keyword spy from right here if you find an app you want to look at their possible keywords. More on that in a bit. There are keyword suggestions, a paid feature, where you choose keywords you want to use as seeds to generate keywords from, and the tool will look for good keyword opportunities for you based on those keywords. You can also translate keywords to other languages for localization optimization for other app stores. The keyword spy compares your app, or any app you chose, against another app. Showing what their likely keywords are – based on what they are ranking for – and looks for keywords that are shared between the two apps, allowing you to get ideas for other keywords you might not have thought of. This is where I found larder btw, which is the very bottom keyword on the last image. Lastly, you can track competitors – you can add multiple competitors to track – to see stats on them such as rankings, their ratings, and their last update. There are also Enterprise features – for a paid enterprise level account – which I wont go into because I have not used them, nor do I plan to any time soon, since I get almost everything I want for free. I do plan on buying their monthly plan once I am making enough money to support such a purchase, because I have seen some pretty impressive gains since using them. First, I put in my keywords list to optimize. I wanted to see how I was doing already. I found out very quickly that there were many keywords I was trying to rank for that I would never rank for – I had multiple keywords that had 10,000+ apps trying to rank for that keyword, and the keyword was only partially related to my app. Once I found the keywords that I should cut from my list, I had a bunch of extra space, so I started using the keyword research tool to find other keywords that better described my app, while having much less competition. Now I rank less than 200 for many of my keywords, and some of my keywords are even top 25. It is likely that this is where my downloads are coming from actually. Once I rank better for some keywords, I’ll start to rank better for others. And each of the app stores is different. Each country, sometimes its a set of countries, has its own app store, with its own charts and rankings, so considering these factors can also lead to more downloads outside of the US. If I can get a spike in traffic, from my online marketing efforts, I think I can get a HUGE boost in my rankings – I’ll post more information about that in another post when my online marketing efforts start to kick in a little more. Well, thats all for now. If you have anything you would like to add, maybe a tool you use that you like more, comment below or hit me up at @iOSDoug to chat about it. I love hearing from y’all, so don’t hesitate to contact me about anything.